Our feet are undoubtedly the most hard working part of our body. It has to bear the force of the entire body weight – more force than most other parts of the body have to contend with. Sometimes the strain on our feet is magnified when we choose to wear poorly-fitting shoes or stand all day. But the main problems are not due to fashion and work commitments. Even when we try to do our best to reduce foot strain, it is not always possible as part of an active lifestyle. So how do you find the balance between being active and avoiding foot pain? Apart from the daily stresses and strains on the feet, sometimes foot pain is a symptom of a serious underlying disease. It is important to be familiar with some of the causes of foot pain. If you have open wounds, blisters, skin rashes discoloration, outgrowths, swelling or deformity of the foot then it is important to first speak to your doctor. Further tests and scans may be necessary to diagnose your foot problem. 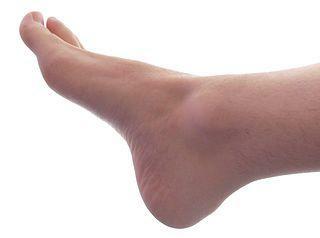 Flat feet may require special orthotics and simple measures that helps with general foot pain may not be useful. But if your foot pain is just a result of everyday stress and strain with no serious underlying problem then here are some ways you can help relieve it. We all think that we know what the “right” shoes are to keep our feet healthy and pain-free. But it is always good to get the opinion of a professional if you are experiencing sore and painful feet after a hard day at work. Speak to your family doctor, physical therapist or podiatrist. Your footwear should suit your type of daily activity, body weight and any existing foot or limb problems. It should give your feet adequate support and ensure that your body weight is evenly distributed across the entire sole. One of the major problems when it comes to footwear is wearing high heels and tight shoes. Remember that fashion has to go out of the window in order to keep your feet healthy. Foot pain is often due to sore, tired and strained muscles, ligaments and fascia that are major components of the feet. Before the strain and inflammation can ease, we are usually back on our feet the next day further exacerbating the problem. There is no chance for the feet to heal. You may not be able to stop your daily activities that contribute to this strain, especially if it is work-related. But you can help relieve some of the strain with heat therapy. Try soaking your feet in a bath of warm water for at least 20 minutes. It helps with the circulation and relaxing the muscles of the feet. Bathing in a tub may be sufficient. But soaking your feet should be avoided if you have open sores or wounds on your feet. While a warm soak or even a hot water bottle can be helpful in relieving the daily strain on the feet, heat therapy should be avoided if you have injured your feet. Instead you should use ice. While immersing your feet in a bath of cold water helps with inflammation, it can reduce the blood circulation in the area. If you are using an ice bath to soak your feet then do so only for short periods – a few minutes at most will suffice. Rather use and ice pack and apply it to the injured area of your foot. Directly placing ice on the skin should be avoided as it can damage the skin. Icing should be done for only 2 to 3 days after the injury. Heat therapy is helpful thereafter. There are probably very few measures that can help to relieve foot pain better than rest. It is not simply a matter of not standing. Even sitting with your feet on the ground does place some force on it. The best way to rest your feet is to elevate it. There is no need to retire to bed if you are not yet ready to sleep. Just put your feet up as often as possible – even at the office if you can. Elevating your feet also helps with circulation in the lower limbs and can help reduce swelling of the feet. In most instance elevating your legs slightly is sufficient. But if you are experiencing severe swelling and pain then try to elevate your feet above the level of your heart. You can do this by lying down and placing a few pillows under your legs. A gentle foot massage can be very relaxing. It is also helpful in easing some of the muscle strain and swelling. But it should not be too forceful or it can injure the feet. These days electronic foot massaging devices on its own or as part of a foot spa where you can soak your feet may also be useful. Massage aids by easing the muscle spasm and getting the circulation in the feet going. Never massage your feet if it has been injured. Try soaking your feet in warm water for a few minutes before a massage. The effects of the massage can be accentuated by heat and using muscle rubs. Some of these rubs aid with pain relief while others may have a mild anti-inflammatory effect. It is not possible for most of us to go barefoot when we are out of the house. But when you are at home, you have the freedom to be barefoot and you should do so as much as you can. Being barefoot relieves the compression on the feet that is caused by shoes. It also allows the feet to air which is helpful in avoiding fungal infections. Your feet are able to return to a natural state without shoes. Remember that your feet have developed to optimally bear your body weight provided that you do not have any underlying foot or gait problems. Shoes strain the feet by unevenly distributing the force on the soles and limits the normal flexibility of the feet to some extent. Many of us feel that it is acceptable to take a painkiller or anti-inflammatory drug for a headache but not so for foot pain. If your feet are aching and medication is not contraindicated, then take a few pills. Ideally you should be using medication prescribed by a doctor but over-the-counter anti-inflammatory drugs may suffice every now and then. It should not be used daily for a long period of time to treat your foot pain. Drugs can help reduce the inflammation much more quickly and effectively when combined with rest, heat therapy or icing the feet. This applies both to oral drugs or topical applications that can be rubbed or massaged on the feet.